While the Bon Appetit article had mentioned Trattoria Centrale’s pizzas, I wasn’t quite prepared for the way the restaurant handled the busy business lunch crowd. 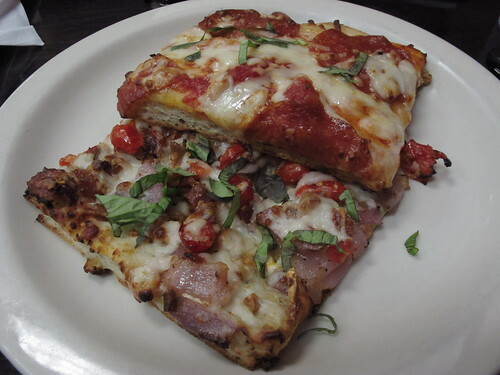 Instead of pizza made to order, huge trays of premade square or Sicilian style pizza filled the counter. When an order was placed, a serving size square was popped into the waiting ovens and a few minutes later it was ready for the hungry customer. After placing an order for a couple of slices and finding a table, I barely had time to crack my book before my order was ready. 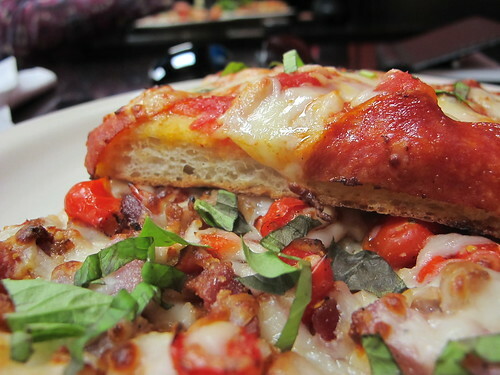 A slice of pepperoni and a slice of bacon pizza, it was a fairly anticlimactic scene. Taking a bite from the pepperoni, the thickness of the slice and the simple tomato sweetness of the sauce were the first things I noticed. Even though this was premade pizza, it was obvious the nicely charred crust wasn’t an afterthought. A simple but nice feature was the inclusion of the basil chiffonade. 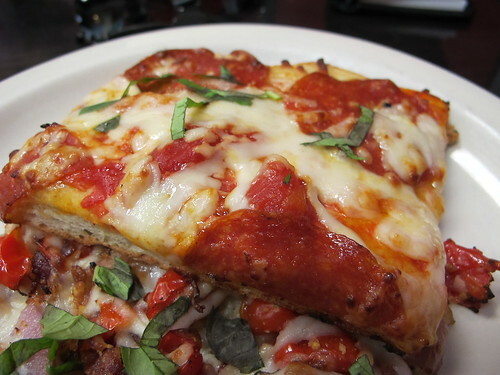 It may have been a small detail but it really brightened the flavors of the pepperoni slice. 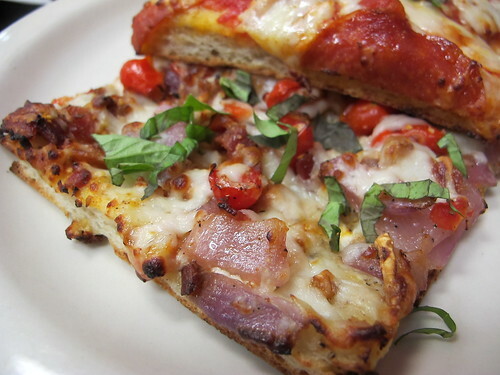 While tomato and basil may have dominated the first slice, it was red onion that took over the second. Every bite may have contained the crunch and sweetness of caramelized red onion, but the bacon still played a subtle yet noticeable role. Two slices and an espresso later, I have to admit that my first thoughts of square pizza in kindergarten had been undeserved. Although this pizza is square and reheated, it was damn good for a premade slice. However, I couldn’t help but wonder about pizza made to order. Is that available in dinner service or is it precooked slices all the time? 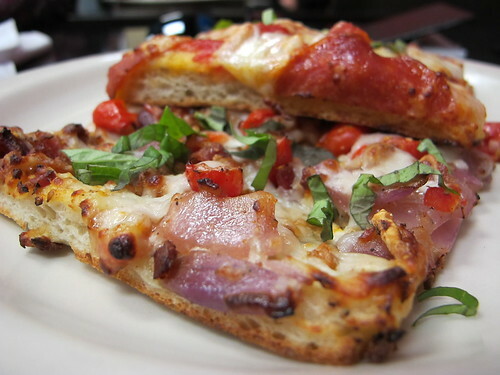 Either way, Trattoria Centrale makes some of the best heat to order pizza I’ve ever tried.